Warning- this post contains a (mildly) graphic image. Proceed with caution. We have one outdoor only cat. No dog door. All doors and windows were locked. The dogs were locked in our room all night. Elicia Cárdenas from The Deskless Classroom suggested it become Monday’s lesson plan- so here we go!! 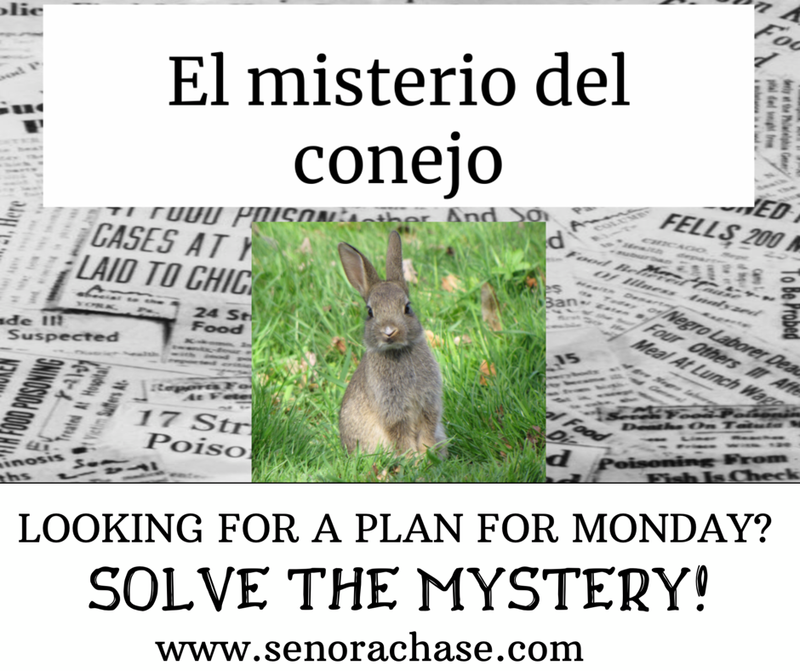 If you’re looking for some compelling Spanish, focusing on rooms of the house and high frequency verbs, feel free to share the mystery with your kiddos too! After we’ve got a handful of teacher videos, I’ll pass along the student link so your kiddos can hear other class theories from around the globe. Check back in a week or so! Thanks!! The cool thing about teaching with Comprehensible Input is that you can talk about anything- the Virginia-Auburn Final Four game, prom coming up next weekend, bunny remnants on my living room floor-anything…so long as it’s compelling and comprehensible! Monday I have my first formal observation with my new evaluator. We met on Friday to talk about my lesson plan- which is now no longer my plan! We’re going to discuss the mystery of the bunny! It’s a risky move… could be a disaster or could be awesome! Wish me luck!! Next Considering a Master’s Degree? haha usted es TAN creativa, Senora!!! SO BRILLIANT I CAN’T EVEN HANDLE IT!!! I used to have a cat that was an accomplished squirrel hunter and killer. (He killed 11 that we know of but then we went on vacation and lost track.) At first we thought it was the dog until we saw the cat on the sidewalk approaching the house with the limp body of a squirrel hanging from its mouth. The cat then promptly deposited the squirrel at the paws of our dog and the dog claimed it as his own. Good cover dear kitty; you had us fooled for a few weeks. Do you think the dog was blackmailing the cat? Deposit 1 squirrel per day or we’ll expose your secret. Totally doing this! Is there a deadline for the videos? I just showed it today and need to show one more group tomorrow (SATs). Would tomorrow be ok? No deadline! I’m on Spring Break next week, so We won’t watch them until we get back the following week! My students and Jen Schongalla’s students may have a heart attack waiting to watch them as we will both be on Spring Break the following week so our kids won’t know what happens til almost May. The anticipation! Hahaha- I hope someone has a plausible explanation because THERE STILL ARE NO LEADS!! Thanks for sharing! I used the level 3-4 version in an intermediate-level college course, and my students really enjoyed it. They’re eager to know if the mystery is solved! LOVED YOUR VIDEO!! Especially the para “para que lo aceptara como familia” 🙂 Muy chistoso, y muchas gracias por participar! Finally got to use this with Spanish 1 classes today. I heard so many good ideas, I am not sure how we will narrow down to one idea for the class on Monday. Some students are wondering if your door was locked and if you have any students who are unhappy with their grades… Gracias por crear este misterio fenomenal. A lot of my students think it’s “muy probable” that there are students who hate me enough to leave a half of a dead rabbit in my living room. Thanks, guys! Yes!!! That’s perfect! My kiddos will love it! !